Keeping your makeup bag clean is a challenge. It looks pristine when new, but over time the spills and smudges accumulate and can’t be ignored anymore. 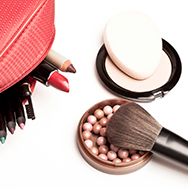 Let’s own up to an embarrassing truth: Your makeup bag needs a makeover of its own! It’s easier than you think to get your bag back in tip-top shape. We’ll show you quick and simple ways to clean it up, plus some good rules of thumb to make sure the makeup in your bag isn’t past its prime. How you clean your bag depends largely on the material it’s made of. If it’s a cloth or cloth-like material, washing the bag all over, inside and out, is an option, depending on how it’s constructed. In most cases, the safest way is to hand-wash your bag with a gentle dishwashing detergent. If your bag is a bit more durable, toss it into a mesh bag (to protect zippers or VELCRO®) and put it in your washing machine, on the gentle wash cycle. In all cases, it’s best to air-dry your bag to avoid the potentially damaging high heat of a dryer. If your bag is made of plastic or a plastic-like material, wiping it down is the way to go. To remove stubborn makeup, use what you would on your face—waterproof makeup remover applied with a cotton pad or soft cloth. It will help dissolve stuck-on foundation and long-wearing formulas. To make sure your bag is disinfected, follow up with an alcohol-based cleansing wipe or spray-on disinfectant, and make sure it’s completely dry before you put makeup back inside. Mascara and eyeliner (all types) – 3 to 6 months. Cream, liquid, or stick foundations and concealers, cream blushes – 6 months to 1 year. Powder-based products (e.g., blush, bronzer, highlighter, eyeshadow) – 2 to 3 years. Lipstick, lip gloss, and lip pencils – 2 to 3 years. Lip balm – 1 year. Also, examine how your products look and smell. If there’s a noticeable change in the texture or color, or if it begins to smell a bit “off,” it’s time to toss it! Keeping your makeup brushes clean is important, too, and it’s not nearly as involved as you might think. We have some great tips for cleaning brushes, including one industry-insider shortcut to spruce up those brushes if you’re tight on time!